Drive past a variety of historic barns that pepper rolling hills in scenic Upper Bucks County. The Heritage Conservancy&apos;s Barn Voyage! Upper Bucks Self-guided Driving Tour is the perfect leisurely cruise to discover Bucks County&apos;s unique history and beautiful treasures. Located on the north side of Route 412 at Moyer Road is a large Standard barn of three-bay construction, where the stonework extends to the peak of the roof. Though difficult to see while traveling the busy road, there is a single round porthole at the very peak of the barn above the window. This two-level bank barn is a rare example of a Pennsylvania German Sweitzer barn, located very close to the adjoining road. 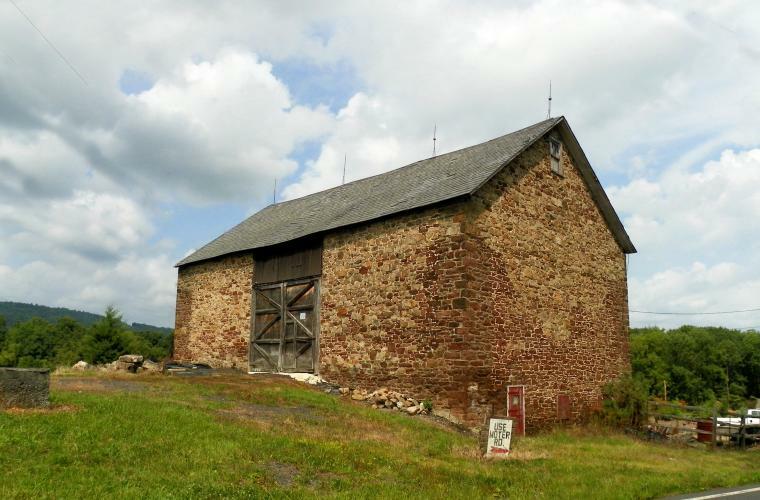 Sweitzer barns are the earliest style of forebay barns in Pennsylvania and were precursors of the Pennsylvania Standard barn. The key visual distinction between the two barn types is that the roof of the Sweitzer barn extends out over the forebay, giving the barn an uneven gable or saltbox roof appearance. The next stone barn is located right along the road and has central bays constructed from wood. The central section of the structure represents a barn with a double threshing floor (or wagon bay), giving the barn a four-bay wide configuration rather than the more typical three-bay configuration found on smaller barns. Although difficult to see from the road, the westerly gable end of the barn has a pair of door hoods above gable entry doors. Next is one of a number of English Lake District barns featured along the tour. It has several distinctive features, one of the most unusual being that the barn faces north; most barns faced south to allow the sun to warm the stable area. This barn has a pent roof along the north elevation that provided protection to stable doors. This frame-over-stone bank barn is an example of a simple structure that still has small ornamental details indicating the time and pride that went into its construction. These details include diamond-shaped cutouts in the peaks of the gables that are referred to as "swallow holes." These holes provided ventilation in the hayloft and access for swallows, owls or martins. This barn resides on a working farm and is used for its original intention of crop and farming equipment storage. It still stands as a testament of the hardworking farmers that helped to build our country. Perhaps one of the most recognizable barns in Upper Bucks County, the next stop is an architectural gem. Its prominent location and large, three-part cupola make it a destination barn. The cupola has a tall section with a pyramidal roof flanked by hipped roof wings with windows and louvers. The barn was designed by the property's original owner, Henry S. Jacoby, in 1896-97. This barn is a Standard Pennsylvania barn. It is a stone structure with a frame front (forebay) wall above a recessed stone wall with a number of doors that lead into separate stalls. The gable ends of this barn are stone all the way to the peak. The wooden forebay is highlighted by four swirling hex signs. The barnyard has a projecting gable roof wing and a stone wall that forms an enclosed area for animals. There are actually two barns on opposite sides of Hickory Lane. The barn on the west side is a traditional gable roof structure, and the one on the east side has a gambrel roof. The gable roof barn forms the core of a barn complex. There is a main, two-story bank barn with a series of extensions on the rear bank side, as well as a nearly independent gable roof wing attached to the southwest corner of the main barn. The gambrel roof barn (pictured) is a ground barn with the main doors located on either end of the barn rather than on the long sides. Located along a sweeping bend in the road, this preserved farm complex has a remarkable collection of buildings. There is a large Pennsylvania Standard barn highlighted by hex signs painted on the frame wall. The forebay had originally been recessed, with the main floor of the barn cantilevered above it. This wall has since been moved out to the eaves in order to create space for horse stalls in the lower level. The structure has two perpendicular wings that form a courtyard type of barnyard. There is a multi-sectioned stucco brick and stone house and a truly remarkable stone-ended log out-kitchen along the road. This property stands as a testament to a preserved farm that brought nineteenth century buildings into twenty-first-century agriculture. The property features a farm store that brings the bounty of the farm directly to the public. The barn is a frame bank barn that has been covered with shingles. Although lean-to sheds have been added to the south and east sides of this barn, the recessed forebay can be easily seen once inside. The main barn is supported by a large, double drive-through corncrib silo as well as other farm structures behind the barn. This barn represents an example of a working farm. The main barn is supported by a series of smaller historic and modern outbuildings, giving the appearance of an agricultural village. Looking closely at the forebay of the main barn, you can barely see faded hex signs on either side of the winnowing doors; the fading decorations are symbolic of the end of an era of farming at the close of the twentieth century. Like many barns, the recess under the projecting forebay was enclosed to allow for the housing of a larger dairy herd. This barn shows how traditional barn features were maintained even as new barn features were incorporated. This barn is a traditional Pennsylvania Bank barn with a projecting forebay. The most dominant feature of the barn is its gambrel roof. This gambrel barn is slightly unusual in that there are no large doors under the peak for loading hay into the large loft. Like older-style barns, this barn has a walled barnyard and a series of smaller sheds and structures, including a double drive-through corncrib that supports the main barn. Most early stone barns used narrow ventilation slits; however, there are a relatively small number of barns in the region that have round ventilators, such as this barn where the round ventilators can be seen on the gable end facing the road. The barn has another unusual feature on the side opposite from the road where there is a projecting peiler eck on the front elevation. The one on the end of the barn facing the road may have been removed when a small shed addition was constructed. Onlookers can see where a gable door with a triangular hood was filled in on the gable end of the barn facing the road. This is an example of the classic Bucks County barn, also known as a Standard Pennsylvania barn, with a frame superstructure set on top of a stone first level. The frame level extends out over the stone stable level, creating a protected area in front of the stable doors. Like many of these types of barns, the projecting forebay is supported by simple posts.